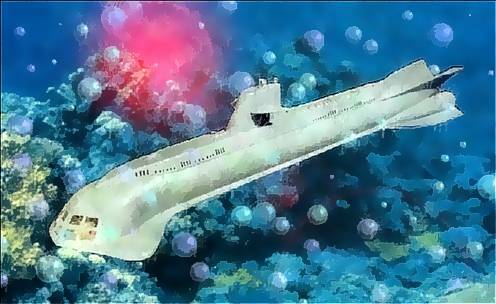 Submarine Seaview, Variations on a theme. Variations on a scene (or two). Such fun is discovering a new (to me) program like Corel! Following are some variations on a theme I came up with while goofing around. The first sample below became part of the basis for the cover of my novel, the "Nemesis Syndrome." The Seaview is a photograph of my 32" Lunar Models movie version. 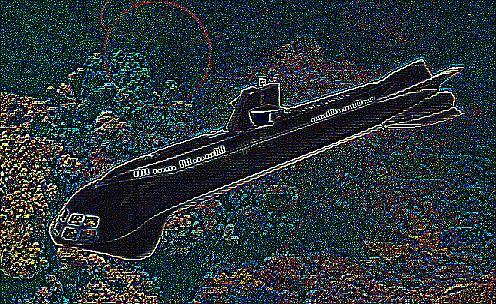 I carefully cut it from a 5X7 print which I Scotch-Taped onto a photograph of the sea floor (as immediately below) or other undersea photos and manipulated a scan of the result with Corel 8. Not great art, perhaps, but fun to do, and hopefully at least eye-candy for you.